I’m a fan of the “millstap” YouTube channel, and I’ve been intrigued by the fact he uses an amp screen in front of some of his amps. They apparently control the projected volume a bit, but also make recording from the amps better in that a mic between the speaker and the screen is more focussed. I understand it’s also something that Joe Bonamassa does. With that, and my DIY mind at play, I decided to look at building one. The first challenge is that Perspex is somewhat expensive for a “give it a go and see what happens” project – probably about $50-70 for a sheet from Bunnings Hardware. I was sure there must be offcuts floating around so figured I’d just wait until I sourced some cheaply. Two days later I noticed what I think was an old fish tank being tossed out by the neighbours. There were two really big sheets of 5mm Perspex I figured I could salvage. 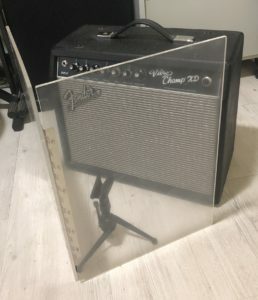 They were a bit scratched up, so I treated them as I would with finishing a guitar build: sand with 1200 wet and dry, then 1500, then 2000, then automotive polish and swirl remover. It took an age but ended up working well. A quick trip to the hardware store and I bought a 30cm “piano” hinge for about $10. I also bought the smallest screws I could find. Assembly was pretty straight forward, with the only important bit being to make sure the pilot hole I drilled in the Perspex wasn’t too big for the screws. Once the hinge was installed I nipped the ends off the screws and filed them flat. So, does it work? Hard to say with the volume aspect as I’ve only used it at home, but it does seem that for recording you do get a much clearer signal. 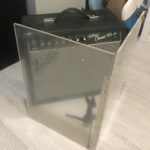 I’ve got plenty of Perspex left over to make a larger one at some point for a gigging amp which I will do at some stage. All in all a simple but satisfying project!